How old was the first human civilization? How and why did it evolve? It is generally believed that the key to civilization was the development of agriculture. The theory is that farming freed wandering groups of hunter gatherers from their constant quest for food, allowed them to settle in larger communities, and gave them the leisure to develop rich and complex cultures. This belief is supported by the fact that the rise of ancient civilizations generally followed the development of agriculture in fertile valleys. Millet grown in the Yellow River region of China supported the birth of ancient Chinese civilization around 2000 B.C1. and the Indus Valley civilization emerged in northwest India around 2800 B.C.2. Further back in time, around 5000 B.C, the Chinese began growing rice in the Yangtze Valley at about the same time that the ancient Egyptians began growing wheat along the Nile3. However, the 1994 discovery of a complex of stone circles at Gobeckli Tepe in south eastern Turkey pushes the dawn of civilization back even further. At the same time, it raises many puzzling questions. Gobekli Tepe4 is a complex of circular stone structures built on the top of a man made hill. Each structure consists of a circle of T-shaped pillars encircled by double stone walls back-filled with rubble. Facing each other at the heart of each structure stand two gigantic limestone pillars, also T-shaped. Many of these giant pillars are as much as 18 feet high and weigh 16 tons, and some are carved to represent gigantic, faceless human forms with arms reaching down their sides and around to their fronts. Although presumably made with primitive stone hammers and axes, the pillars are carefully smoothed and decorated with carvings of wild animals and birds. Some of the carvings are of simple almost abstract shapes while others are highly sophisticated three dimensional sculptures. The site was excavated by German Archaeologist Dr. Klaus Schmidt13. In 1994 Schmidt investigated the Gobekli Tepe site, which American archaeologists had previously dismissed as unimportant. He was intrigued by vast numbers of flint chips that he saw lying around, and began excavations the following year. A technique that archaelogists use to determine the age of a site is carbon-14 dating. This is a dating method which measures radioactive emissions from the carbon in organic material such as wood or bone. By comparing the level of radioactivity in an organic artifact with that of carbon in a living organism, scientists can measure the decay in its radioactivity levels and make a fairly accurate determination of its age14. The results of Carbon-14 dating at the Gobeckli Tepe site were absolutely mind blowing. The site was proved to be over 12,000 years old. Excavation of the site gradually uncovered three stone circles, and a 2003 geomagnetic survey revealed over 20 more stone circles hidden beneath the earth. It seemed that over a time span of approximately 2,000 years there had been a repeating pattern of circle building and burial until construction ceased around 8200 BC. While it would make logical sense that the first circles would be crudely built, and that the builders would gradually become more skilled, the workmanship of the pillars actually degenerated over time. While a large, well organized workforce would have been required to erect these structures, researchers did not find any evidence of agriculture in the area and were puzzled as to how these workers had been fed. They found no evidence of farming or domestic animals, pottery or metal tools. What they did find were piles of bones from wild game animals such as gazelles, and they came to the surprising conclusion that Gobeckli Tepe was built by a hunter gatherer society5. How could small wandering bands of hunter gatherers have organized such a complex building project? How did they transport gigantic stone pillars without wheels or large pack animals? Why did the quality of the workmanship gradually degenerate? Why were the stone circles hidden under the earth? The idea that Gobeckli Tepe was built by hunter gatherers is surprising. The common image of hunter gathers is of small wandering groups that spend the majority of their time searching for food and which are constantly on the edge of starvation. This picture contrasts with the popular image of farming as a way of providing abundant food. However, many hunter gatherer societies devoted less time to obtaining food than early farmers, ate a richer and more varied diet, and had a great deal of leisure time which they could devote to cultural activities such as storytelling, dance, music and art8. The people of the Northwest Pacific Coast of North America, for example, traditionally fished, hunted wild game and sea mammals, and gathered roots and berries. They had no need for agriculture7. A combination of a bountiful environment and sustainable resource management allowed them to develop stratified societies with nobles, commoners and slaves, a widespread trading network, a complex mythology, and a rich artistic tradition. It is therefore definitely conceivable that the sophisticated carvings at Gobeckli Tepe arose out of an artistic tradition developed in a hunter gatherer culture. However, it is still difficult to conceive that sculptures like the one in the photograph below were created with stone age tools. It is also difficult to understand how Gobeckli Tepe apparently arose from nothing. The excavations have revealed no evidence that any people actually lived at the site: no houses, no pottery, no burial sites, not even any cooking fires. One possibility is simply that nothing remains of the culture because the objects they used have decayed over time. The northwest coast people, for example, used perishable materials such as wood and bark which rot quickly in the damp Pacific coast climate. Their houses and boats were constructed with wood, and instead of pottery they used wooden boxes and woven baskets. They also created monumental wooden totem poles which are constantly being worn down by wind and rain. These will eventually fall to the ground and rot, leaving no trace that they ever existed. Another possibility is that evidence of the culture is still waiting to be discovered or identified. There are, in fact, some 15,000 year old village settlements in the near east which are evidence of a settled hunter-gatherer society. Known as Natufians, these people enjoyed a generous environment where they hunted gazelles and gathered wild grain. 20 miles from Gobeckli Tepe, drowned beneath a lake created to produce hydro electricity, is a hunter gatherer village known as Nevali Çori10. Before the village was flooded, archaeologists discovered a ceremonial building with T-shaped pillars and animal images strikingly similar to those of Gobekli Tepe. They also found evidence that the inhabitants of Nevali Cori had so much meat that they built special storage buildings to preserve their surplus. Were these the builders of Gobeckli Tepe? Perhaps. But with the remains of their village lying at the bottom of a lake it is virtually impossible to learn more about these people. 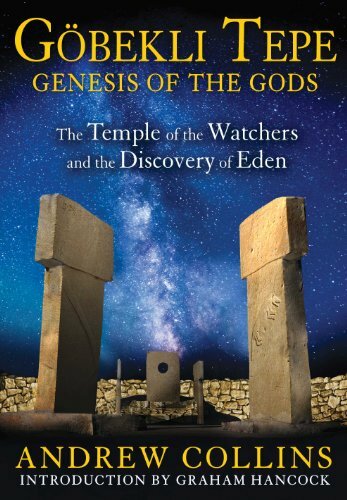 Because he found no evidence that people lived at Gobeckli Tepe, Professor Schmidt6 concluded that it was a religious center and labeled it the world's first temple. He imagined that it was a gathering place where people came together for religious rituals and feasts, perhaps bringing gifts and tributes. To me, Schmidt's vision fits well with a highly developed hunter gatherer society. It sounds strikingly similar to the potlatch ceremonies of the Pacific northwest coast people9. These were elaborate ceremonies which brought many bands and nations together from far and wide. They were occasions for trade, gift giving, feasting, ceremonies and the confirmation of status and legal hunting and gathering rights. It has also been suggested that Gobeckli Tepe was a sacred burial ground. small pieces of human bones have been found in the material used to backfill the double stone walls. Professor Schmidt speculated that these bones were brought in from an outside burial site for ritual purposes. A carving of a vulture and a headless human body on one of the pillars, however, suggests something more sinister. It is possible that Gobeckli Tepe may have been used for sky burial, where bodies were laid out to be eaten by vultures. The custom is still followed in Tibet, where even the deceased's bones are sometimes pounded into a pulp for scavengers to consume, leaving no evidence of the dead person at all11. Similarly, experts point out that lack of evidence that people lived around the site is not definitive proof that no-one lived there. If they did, then the complex might have been a community gathering place. Not all experts agree with Professor Schmidt that Gobeckli Tepe was a temple. While this is one possible explanation, it could also have been a burial site or a communal gathering place. It might have been all three, or something else altogether. the reason why an ancient people were so determined to bury Gobeckli Tepe may be the greatest mystery of all. While it took a great deal of effort to construct the stone circles, it is almost inconceivable that they spent an equivalent amount of effort to bury them under tons of dirt and rocks. Perhaps a conquering people wished to wipe out the religion that it represented. If it was the site of sky burials, later people horrified by those funeral practices may have wished to obliterate its memory. Or it may have been an act of respect, and an attempt to protect the site from the destructive power of the elements. No matter what the reason, the people who buried Gobeckli Tepe protected it well. In comparison, the Sphinx, built a mere 4,500 years ago12, has weathered badly. It appears much older than the carved pillars at Gobeckli Tepe, which appear almost as new and fresh as they must have been 12,000 years ago. After spending 17 summers excavating Gobeckli Tepe, Professor Schmidt died in 2014 leaving behind a mysterious archaeological dig and a legacy of unanswered questions. Given it's location near the Syrian border and current political instability in the region, it may be a long time before some of these questions are answered, if at all. Fascinating stuff! I had not heard of this find at all. Hopefully, someday these questions can be answered. Those pics are amazing. Thanks Leigh. Maybe more sites will be discovered which will help to cast some light on the whole thing. Most excellent. Big thumb's up. Thanks, Vic. I'm hoping to look at some more of these fascinating ancient mysteries in the next while. Thanks, Pat. I enjoyed writing this one.